This Post has already been read 886 times. 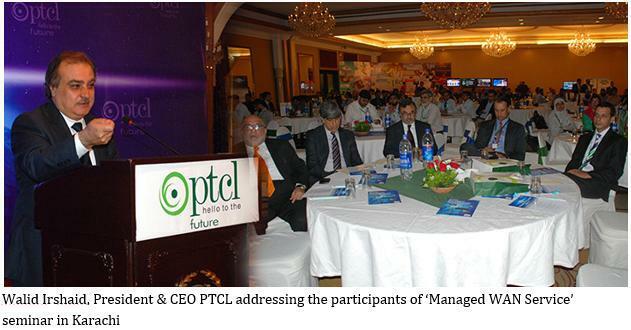 PTCL has organized a seminar at Karachi to introduce newly launched ‘Managed WAN Service’, which caters to the growing ICT needs of its corporate customers. Walid Irshaid, President & CEO PTCL; Hamid Farooq, PTCL Senior Executive Vice President (SEVP) Business Development; Zaman Gulzar, Executive Vice President (EVP) Business Zone South and Samer Ajjawi, Advisory Team Member Etisalat along with other company officials and a large number of corporate customers were also present at the occasion. ‘Managed WAN Service’ helps companies outsource their networks and personalize modules for individual needs in a secure, dependable and cost effective manner and provides online analytics and reporting, proactive network monitoring and elimination of capital expenditure of developing a network.